One lie constituted the generative origins of the Old Calendarists which, to this day, weakens the mission of Orthodoxy with the influence of these schismatics towards simple Christians. And which lie is this? That during 1583 and 1593, two Local Synods under Patriarch Jeremiah II - which convened in order to condemn the all-daring overthrow of the First Ecumenical Synod’s ruling concerning the Feast of Holy Pascha under Papism - also condemned the calendar change. And how was this lie created? From a forgery which a premature zealot, Iakovos of New Skete, made in the handwritten codex of St. Panteleimon's Monastery (Mt. Athos), contained in number 772! The sneaky zealots applied these so-called anathemas to intimidate and frighten the simple Christians and to support their schism upon this lie - just as all schisms are born from absurdities, forgeries, and frauds which trick the simple and unlearned. The history of the Old Calendar schism is simple. In short: After the end of World War I, in 1919, the Orthodox Empire of the East, for secular reasons, wanted to adapt the Julian Calendar to the Gregorian, which is thirteen days ahead. And in Greece, the government of that time started fermentations with respect to the Church, which declined to part from the Julian Calendar. But the revolutionary government "rolling pin", despite the objection of the Church, proposed through Royal Edict, the consecration of a Revised Julian Calendar by thirteen days. Thus, with the use of the two calendars, problems were created. When the Church, in consultation with the Patriarchate and the Orthodox Churches, accepted the Revised Julian, March 10 of 1924 was called the 23rd; Pascha remaining untouched. This is the entire history. The following year gave rise to disorder in the consciences. However, whoever had a mind remained calm with the explanation that was given, namely, Orthodoxy was not adulterated, neither in dogma nor in its traditions. Again, whoever was dominated by mistrust and suspicions, along with their secret self-conceit, suffered from the "you don't persuade me even if you persuade me" mentality. These people made an uproar that the Church fell into heresy. And thus the Old Calendarists were created. On the other hand, a multitude of schisms have existed before over nothing, just as the Old Calendarists. On the Holy Mount Athos, after the torment of the problem, 5-6000 monastics came to the conclusion that the Orthodox Faith is not affected but, for various reasons, they would maintain the Old Calendar and they would not break off ecclesiastical relations with the Local Churches (that would have made the leap of 13 days), who were considered as equally Orthodox. A sufficient number of monks became zealots outside of the monasteries and a few priest-monks went to the cities and proclaimed that the addition of thirteen days which the Church accepted is heresy. They did this without taking into consideration that the Church would not have accepted to innovate if the State did not previously innovate and thus provoke the confusion with the two calendars. I write these things, in relation to the issue of the Holy Monastery of Esphigmenou, for those who ask me. I have already responded in a previous article. Here once again I repeat that the Holy Community respects the freedom of conscience of the zealots and tolerates them even though they are schismatic, and according to the Constitutional Charter it should banish them from Mount Athos. The case of the Monastery of Esphigmenou is different. The zealots of Esphigmenou could stay in Mount Athos, but not within the Institutions of the Holy Community. Either they agree with all the Holy Monasteries or they disagree, so since they are schismatic, they must leave by themselves. Yesterday I received a letter from a friend of mine, who wrote to me that in an interview the "Spiritual Father" of the Monastery of Esphigmenou, on a state channel, said: "During the time of the Patriarch Athenagoras there were the fiery articles of the Venerable Father Theoklitos Dionysiatis. Now that these events happen, he remains silent." I do not know him, I knew however his “predecessor” Efthymios, as I wrote in a previous article of mine in the newspaper Orthodoxos Typos. But in this case I am bound to answer to the question of the "Spiritual Father". Indeed, I used to write fiery articles which constituted a whole book about the papal statements of Athenagoras. Now what can I write? Now many ignorant people perceive the social type relationships and encounters with the papists as cooperation and co-prayers of the present Patriarch? Much has been said for Ravenna. If, despite the canons that only Orthodox should appear for Holy Communion, sometimes papists escaped attention and communed, does this mean that the Patriarch did that intentionally? We must be careful not to blame the leaders of the Church that they are Ecumenists because modern conditions lead to meetings and to some amenities and affability with the heterodox. I would like them to see the very Orthodox Archbishop of Athens Chrysostomos II, who raised a true “war” against Athenagoras, address in the Metropolitan Church the Anglican Archbishop or to receive at the Church of the Armenians an honorable address from the Armenian clergyman. What would those people, who complain and blame Patriarch Bartholomew as an ecumenist, say? I read in Orthodoxos Typos and I also received the protest for the Monastery of Esphigmenou from five Christian unions, who are not followers of the Julian Calendar. Well, are they touched by the eventuality of being prosecuted by the Sacred Constitution (the zealots) and aren't they worried and sorry for the deception, that they are schismatic and that they expose the splendor of Orthodoxy? They want to believe that they are guardians of Orthodoxy, but then why don't they attend to the preservation of the truth from counterfeits, either deficiencies or excesses? Either the “Esphigmenites” are seduced and they must be helped so as to repent, or they are Orthodox, so those of the five unions should follow them in their morale. Would St. Mark Evgenikos and Palamas really protect them since they lacerate the Church? Do they know that Gregory Palamas recommended to the Venerable Fathers of the Monastery of Lavra not to have a common cenobitic life with Akindynos, because it showed some signs of deception? They should read, the ones of the five unions, my book "St. Gregory Palamas" and the offprint of the Archbishop of Athens Chrysostomos I "Control of Calendar Accusations”. And they should also read the doctorate dissertation of the present Archbishop of Athens [Christodoulos], in order to see that above the initial lie there were built a series of false and fraudulent ones, as Elder Gervasios Paraskevopoulos wrote to me. I wrote it elsewhere, and I will repeat it. 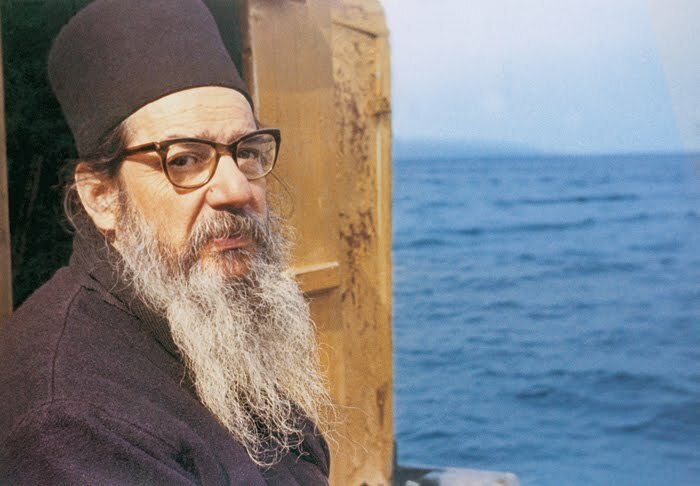 The predecessor of the current "Spiritual Father" Efthimios came to our Monastery, when there were the “Athenagorians” (people who agree with Athenagoras' point of view), which Kontoglou, Archbishop Chrystostomos and myself fought in 1965, and he was ordained Deacon and Priest renouncing his zealotism. Why? After five years he was once again a zealot. Why? When did he read that Athenagoras made papal statements? When he was ordained from an “Athenagorian” bishop didn't he know? And for five years he never commemorated him? This is what zealotism is all about! The Russian Nikita Strouve, in his book Russia Today writes: “Something that Russia has nothing to feel jealous of America about is the approximately fifty sects which exist in Russian as O.O.C.!" Well, is this our sensitivity towards Orthodoxy? Instead of protesting in favor of the delusional ones, who as schismatics lose their soul, since the blood of martyrdom will not rinse the schism, it is wise to enlighten them to return to the Church of Christ abandoning their conventicles. And all this I adduced, because they ask me as being one of the elders of Mount Athos, who has seen many things. 1) Taken from Orthodox Typos, February 28, 2003.